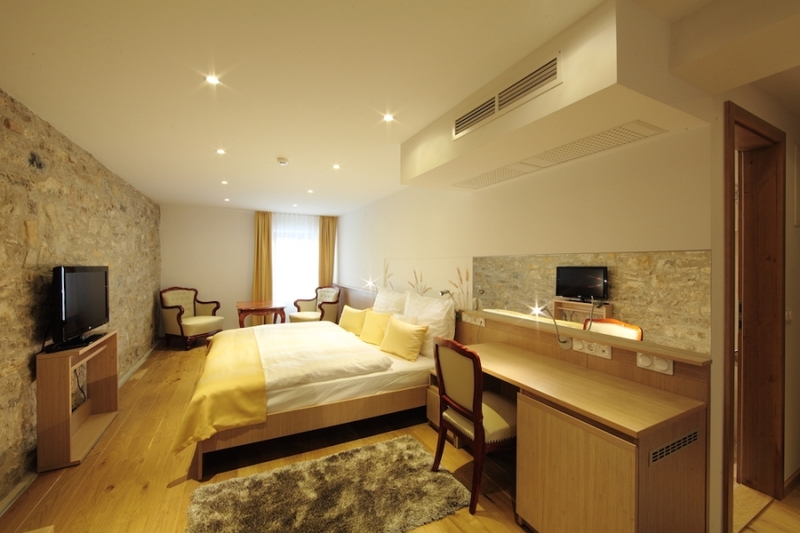 2012 is the year of opening a new Hotel in Veszprém: Hotel Historia Malomkert. It is not only new, but sorrounded by a picturesque landscape, the brook Séd, green areas and the castle from above it is a really unique Hotel as well. In a quiet corner of the city alongside a cycle path that rides to the Zoo, crossing the ancient Margit-ruin. The interior design is also special: several rooms has been uniquely designed, after what the Hotel is also mentioned as a boutique hotel. Since the building was a monument, it had to be renovated carefully: The rooms and the restaurant are connected by one area, water is running under the glass-inlaid floor that looks like a slowrunning brook. Several interesting built-in areas make the Hotel very much worth a visit. Rooms: all of them are uinquely furnished, with a bathroom. Equipment: phone, minibar, safe, air-conditioner, hair-dryer, television, free wifi. Services for children: accomodation and food is free for children under the age of 12, we provide babybed, babytub and highchair for free.